Have the doors closed on the Singhs? Yuvraj Singh is probably one of the most frustrating cricketers in India at the moment. You look at the way he plays ODIs and you would think he *has* to be on the Test team – alas, the two formats are like chalk and cheese. And Yuvraj the ODI specialist and Yuvraj the test batsmen are two completely different players. Yuvraj burst into the International scene with a bang while still in his teens, and showed so much potential – everyone knew he was a future super star. But move over to Tests, and it is a completely different story. An average of 35 in 56 innings is barely passable and if you watched Yuvraj scratch around for his 25 in the first innings, you would start to wonder what he is doing in this team. With Raina (is he another Yuvraj in the making? ), Rohit Sharma, Pujara, Rahane, Kohli, Jadeja, etc knocking on the door, his position is the shakiest in the team. And considering the fact that he was an utter failure when India toured Australia last time around, would you pick him? He hasn’t scored a century in tests in close to 4 years. Sure, he has been in and out of the team in those fours years (which itself tells us something, right? ), but 27 innings without a 3 figure score is just not good enough. Four years ago, when the Indian team was picked to tour Australia, there was one notable absentee – Virender Sehwag. Back then I blogged about why he should be in the team in spite of his poor form (he eventually was included in the squad, but I digress). In the case of Yuvraj, I feel the exact opposite, he should not be picked in the Test team for the Australian team. Having said all this, Yuvraj has one big supporter in the team – captain MS Dhoni, and that may just be enough to pen his name in the team selection. He could also end up scoring a century in the next game against the West Indies and find himself on a plane to Melbourne. I guess, the door hasn’t entirely closed on him yet. For the other “Singh”, Harbhajan Singh, the door is closing a lot faster. Dropped from the team for the first two tests, is in itself an ominous sign. And add to it, good performance from his replacement, Ashwin and poor Ranji performances (none for 92 in the first game and one for 50 in the second match) don’t help either. We all know that Harbhajan and Australia have a history, and some of his best performances have been against them. When Australia toured India last year, I blogged that Harbhajan needs to step up, but nothing has changed in the last 12 months to indicate that he has. If you take out his 7/120 against South Africa at the beginning of the year, he averages around 40 in the last 12 months. Not figures to be proud of. More importantly, he looked totally ineffective in England. Being in the top 10 wicket takers of all time doesn’t mean automatic selection if you can’t back it up with performance. Going Places : India’s Small-Town Cricket Heroes, by K.R. Guruprasad. I was at Landmark, browsing books, hoping to buy some books that would help me spend some alone-time in this new place I’ve now moved into, far from home. Lying in a small heap in “Sports Section”, was this book, the photograph on its cover, gripping my attention. Set my hands on it, read the title, bought it. We, in India, love to play cricket. Anywhere. I’ve played cricket inside my house, on the staircase of my apartment, in the garage, between cars, in my classroom, in school corridors, on the streets, in football grounds, basketball courts, ofcourse in cricket grounds, and have also approved of a couple of bathrooms being large enough to play the game; and also told my colleague in office that the aisle between our cubicles seem to beg us to play cricket. This book tells us how kids who once played like this in small towns, with tennis balls, made it big. It is a fairy tale story for some, bed of thorn for some others. Author, K.R. Guruprasad, from Bellary, tells us how he enjoyed the game as a kid, when the local cricket club had the best ever players one can see, and how it seemed pointless at that point for anyone playing the game to represent the country, as there cannot be any more pride than playing for the local club you grew up watching. Things changed with television age. And the world cup victory. He tells us how people could’ve watched the ’83 WC if they went to big cities, like Madras. But the rest of India had to manage with radio, which would at that age allot a minimal time to cricket inbetween its regular programs. How the author takes us from this introduction to setting before us eleven players from the rural pockets of India who have made a name for themselves at the international stage (or about to…) is magical. He travels from the urban metros to villages, from cricket academies in Bangalore, to sports hostels in Lucknow. He meets people who’ve helped cut to shape the diamonds we celebrate today as crowns of Indian cricket. The XI listed in the book – Mahendra Singh Dhoni, Santhakumaran Sreesanth, Virender Sehwag, Ashok Dinda, Munaf Patel, Suresh Raina, R. Vinay Kumar, Iqbal Abdullah, Praveen Kumar, Ravindra Jadeja and Harbhajan Singh. The books tells us all the hardship that cricket dreamers in the rural India have to face. The lack of facilities, lesser access to media to pronounce their performances to a larger audience, and lack of funds. What keeps them together, however, is their hard work. Sheer hard work. And some wonderful gem of people who actually took them to where they now are. Until the 2001/02 season, Ranji Trophy was zonal. But for the top bracket, rest of the teams would hardly get to play more than 3 or 4 games. It was harder to spot talent. Teams with better facilities would survive most rounds. Lesser teams would be eliminated without even facing big names, and hence always lying behind on quality. Delhi, Bengal, TN, Mumbai, Hyderabad, Karnataka would get to play more and perform more, as compared to Uttar Pradesh, Rajasthan, Saurashtra or Kerala. Selectors saw the same faces more regularly, and cricketers from select regions were more likely to make it to the Indian team. From 2002/03 season on, zonal system was abolished and Elite + Plate league was announced. Every team would play a league, and play as many games as any other team in their league, and play the big names. Competitiveness improved. The author gives UP as an example. UP favoured from the format change, then had a Ranji victory, then had Kaif, and that was a spring board for many more to follow – Suresh Raina, Piyush Chawla, RP Singh, Praveen Kumar. Well, we’ve now even had a Plate League team win the Ranji Trophy. The IPL was an instant hunt for talent across all teams in the country, and some new names propped up on the screen, rubbing shoulders with big names. The new kids from the domestic circuits in the rural India now shared the glamour worn by international stars. They played with them, against them, and in the process learnt new art, made friends to fall back on for advice etc. What IPL gave them more than anything, was money, money to survive the toughness of rural reality. In the book, you will find examples to how the breakthrough of IPL has helped many families break even with the world and start living in peace. Cricket was not a serious option in rural India, not sure if it is today either. Most families aren’t enthusiastic about investing money in their child’s cricket. But, there are some who can see that their kid has it in him to make it to the big level. If you read between the lines, you would actually realise that the “heroes” mentioned in the tagline for the title of this book is actually meant for the mentors. Amazing examples of mentors fill the pages of the book, who, through their whole hearted love for the game and the wards, has put new names on the Indian cricket team. Even today, amidst all the shine and gloss that pampers the cricketers, first thing they do once back home is visit their mentors, spend quality time with friends and enjoy the comfort of home. For the rural people, these kids have always been their heroes, since the day the kid broke their window pane 15 years ago. In urban, there are so many things on your mind, you never know if your neighbour is a hero until he makes an appearance on TV. The author says how the kids in rural region seemed to be extra hard-working. Yes, one has to work hard to survive in the game, but the ones from rural region have to put in extra effort to match players from urban India. The lack of state-of-art facilities, coaches and technology kept their progress rate slower than compatriots. But some broke through. Again, credits to mentors, first for spotting them, and then persisting with them alll through the good, bad and ugly stages of their life before the glory days started. Some coaches still offer tutorials free of cost, some recruit their wards from places 1000 miles away from home, and feed them in their home like their own sons. Such is the hard work and dedication from the mentors, you can only wonder how much they would extract off their wards. The author tells us how these stars from rural regions have had to battle myriad difficulties in their life to reach the top. It was no rose bed. One was 45 days from leaving to Africa to earn a living and survive his family. One had given up on cricket and thought of becoming a truck driver in Canada. How right people find themselves in the right time in these people’s lives is explained beautifully. Giving up was something was an attitude that had to be removed from their minds, and was done well too. Some anecdotes made me smile, some made me weep. If one has to learn something from this book, it is that nothing is reserved to the big cities. If you want something, your determination will take you to the top. Excellent work by K.R. Guruprasad for having put together all this in one book, having traveled from hot and dry places to wet and sludgy streets, just to meet the people who would best paint the portrait of these cricketers we have now come to adore. I recommend this book to anyone who loves Indian cricket. 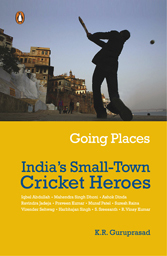 “Going Places : India’s Small-Town Cricket Heroes”, by K.R. Guruprasad. There are many things I am constantly wrong about. No. I am not at Church, it is not Sunday today, and this is not a confession! India’s cances of winning a Test in Sri Lanka in this series. Suresh Raina did confound his critics; including me. I had branded him a ODI and T20 player and had even indicated in a post here that he had jumped the queue, ahead of players like S. Badrinath, Rohit Sharma, et al. But Suresh Raina showed enough in the few appearances he had to indicate he has the ticker, application, determination and skill to last at this level. He even negotiated the many bouncers hurled in his direction. He looked composed, compact and confident. He looked like he belongs at this level. Just on the basis of these outings, I would be happy to ink his name for quite some time at #6 in the Test batting line-up even if he fails against Australia in October and (later on in the year) against South Africa. I was wrong too about Sri Lanka’s ability to produce a good Test wicket. The wicket that was on offer at the P. Sara Oval for the 3rd Test was a Test-wicket beauty. After the flat highway that represented the 2nd Test at the SSC ground, I had all but switched off my TV set for the reminder of the Test series. This series was starting to resemble a few previous series in Sri Lanka where teams would go on to make 3597 runs for 2 declared and then the opposition would go on to make 9656 runs for 3 declared — all before Tea on day-2! You would either have that or have a situation where Muralitharan would take 20 wickets for 3 runs before Tea on day-1 on a pitch made out of un-compacted sawdust from the wood factory down the road! But the pitch that was prepared for the 3rd Test at the P Sara Oval was spot on for Test cricket. I do wish the Sri Lankan cricket Board sack Anurudda Polonowita, the curator of the SSC pitch! Even after a truck-load of runs were scored on the SSC pitch during the 2nd Test, with the loss of only a few wickets — and that too to run outs and batsmen error — the SSC curator managed to hide his head in the sand and blamed the bowlers of both teams for the dull draw in the 2nd Test! But the 3rd Test wicket offered everyone a chance — good batsmen, spinners and pace bowlers. Sri Lanka is, after all, capable of producing good Test match wickets. Right from the time MS Dhoni lost the toss at the start of the 3rd Test match, I did not think India had a chance of winning the 3rd Test match. At the end of day-1, Sri Lanka was 293/4. In order for me to have India ahead at the end of the first days’ play, India needed another wicket at least and also needed to have conceded about 20 fewer runs. Although India did make inroads with the ball on day-2 and although India did get Sri Lanka all out for 425, I did think it was a good 1st innings total in the context of this wicket. India ended day-2 at 180-2, which was the only day of the Test that India ended well, in my books — apart from the last days’ ending when India had won the Test! On day-2, I had India ahead not because the team had made 180-2 (nearly 245 runs behind), which was a healthy score already. I had India ahead because these runs were secured in just 35 overs! But then the quick loss of Tendulkar and Sehwag on day-3 meant that India was again playing catch up in this game. The fact that India made more 1st Innings runs than Sri Lanka was good but in my view the slender lead wasn’t quite enough! At the end of day-3, although Sri Lanka was 45-2, I still had Sri Lanka ahead. On day-4, India had her best session of the game when the spinners wrecked the Sri Lankan batting. However, Mendis and Samaraweera ensured that Sri Lanka put up a competitive target. That and the fact that India lost 3 wickets for not much meant that, in my books, Sri Lanka was once again ahead at the end of day-4. I thought India would not be able to pull this match off on day-5 on a pitch that was deteriorating. I did not expect India to win in the end. In the end, this was an amazing come-from-behind win for Team India — one that this team can take a lot of pride in. Perhaps this will not be an automatic inclusion choice in the “Great Indian Test Victories” DVD compilation. This compilation would automatically include Kolkata, Leeds, Adelaide, Multan or Perth — great victories in the annals of Indian circket history. However, taken in the context of the personnel that MS Dhoni had at his disposal, I would happily vote for placing “Colombo (P Sara), 2010” alongside famous Indian victories in the recent decade. To me this big-list list reads: Kolkata 2001 (v Australia), Leeds 2002 (v England), Adelaide 2003 (v Australia), Multan 2004 (v Pakistan), Sabina Park 2006 (v West Indies), Johannesburg 2006 (v South Africa), Perth 2008 (v Australia), Mohali 2008 (v Australia), Chennai 2008 (v England), Colombo (P Sara) 2010 (v Sri Lanka). I say this because India achieved this victory without a first-XI opening batsman and 3 of its four strike bowlers. Let us not forget that Zaheer Khan, Sreesanth, Harbhajan Singh and Gautam Gambhir were absent from the team that secured this victory. Yes, we might point to the fact that the team did still have great players like Sachin Tendulkar, Virender Sehwag, Rahul Dravid, VVS Laxman, MS Dhoni, et al. However, the best batsmen are rendered useless by un-tested bowlers. In this context, the P. Sara victory is an important one for India. The team showed that it can still do it despite ruthless depletions to the team sheet. As a Team India fan, the future is, still, a worry for me. I do not worry too much about the day when Rahul Dravid, Sachin Tendulkar and VVS Laxman will, inevitably, exit stage-left! When Rahul Dravid got out in the 1st Innings of the 3rd Test, Tony Greig, who was commentating at the time, emotionally appealed for Cheteshwar Pujara to be inked into the team sheet immediately! I am confident Pujara will wear a Team India cap one day. Just as night follows day, for me, Pujara has his named etched on a Team India spot already. However, he will wait his time till when Dravid hangs up his boots. Like Sourav Ganguly and Anil Kumble, the other two members of the Fab-Five, I am confident that Dravid, Tendulkar and Laxman will chose the timing of their exit appropriately. These are some of the most upright Team India sportspeople of our times; a time dominated by Commonwealth Games scandals and 83-year-olds being elected to the Presidency of a national sports body! The Fab-Five stand tall and stand in a separate playing field altogether in an Indian sports space dominated by sleaze, money and power politics. But when the remaining members of the Fab-Five do exit the scene, I am confident that in Cheteshwar Pujara, M Vijay, Suresh Raina, Yuvraj Singh, Rohit Sharma, Sourabh Tiwary, S. Badrinath, Abhinav Mukund, Ajinkya Rahane, et al, India has the batting personnel to step into their big shoes. Pujara will never be a Dravid, just as Dravid was never a Mohinder Amarnath or a Dilip Vengsarkar. Similarly, Suresh Raina will never be a Sourav Ganguly. Rohit Sharma will never be a Sachin Tendulkar. But I believe that Cheteshwar Pujara, Suresh Raina, Rohit Sharma, M. Vijay, Abhinav Mukund, et al, will carve their own stellar paths just as the Fab Four did when they built their careers. What worries me most as a Team India fan is the bowling resources. Bowlers keep breaking apart at the seams. Bowlers that burst onto the scene with much promise and fan-fare vanish a few seasons later. Witness the decline of Ishant Sharma, Irfan Pathan, RP Singh, Munaf Patel, Sreesanth, VRV Singh, Pankaj Singh, Dhawal Kulkarni, et al. Will we add Abhimanyu Mithun to the above list in a year from now? This is certainly a worry for me. Mind you, the spin options are just not good enough for me either. So it is the bowling and not the batting that is a worry to me as a Team India fan. Harbhajan Singh and Australia have a history. It was Harbhajan Singh’s hattrick in Kolkata — which came before VVS Laxman’s 281 — that started the self-belief ride in that epic series between these two sides in 2001. Lest we forget, he hit the winning runs in that nail-biting and tense finish to the Chennai Test, which gave India the series victory in that 2001 series. In 2007, it was his brilliance with the bat in the company of Sachin Tendulkar, and the later “Maan Ki” episode in Sydney that seemed to spur a somewhat insipid and weak Indian team that had capitulated in Melbourne. The team went on to record a phenomenal victory in Perth in another epic encounter between these two sides. In 2008, India was down and almost out in Bangalore in the 1st Test of another epic series between the teams. Again, it was Harbhajan Singh (in the company of an unlikely hero in Zaheer Khan) who turned things around for India with the bat. It may have been almost impossible to conceieve an Indian series victory if India had lost in Bangalore and had the momentum shifted to Australia — although one never knows what may have happened, of course. However, that was a momentum changing innings from a man how loves to irritate the Australians. Such moments can sometimes define a series — like Monty Panesar’s stubborn resistance did, at Cardiff, a few months back! And much as Steve Waugh, that master of “mental disintegration”, allowed himself to be irritated by Sourav Ganguly’s “toss tactics”, the Australians — including their press — instead of ignoring Harbhajan Singh, fall prey to his antics every time. In Vadodara, in the first match of the current 7-ODI series, India were almost down and out chasing a not-so-large total. A huge loss would have shifted the momentum completely Australia’s way. Instead we had a cheeky, pugnacious and gritty fight back from that man Harbhajan Singh (in the company of Praveen Kumar) that almost got India a victory! I have no doubt that that innings changed the way India approached the 2nd match in Nagpur. Although some may point to a depleted Australian bowling attack, I do believe that India would have won even if Brett Lee had played. India played with purpose and determination not often seen by an up-and-down team. One hopes that this momentum is taken into the remaining games too. However, much as I do not like his antics, one just cannot get over the fact that Harbhajan Singh rises to the occasion everytime he plays against Australia. They say that a great player is one that performs at his best against the best. Perhaps it is time for us to recognise — maybe even reluctantly — that Harbhajan Singh is up there after all? In ODIs he has a batting average of 16.56 against Australia, when compared to a career average of 13.42, although his bowling stats against Australia is worse than his career average! His highest score while batting in ODIs is against Australia (the 49 he made last week at Vadodara). In Tests, his batting average against Australia is 21.83 when compared to a career average of 17.01. He bowls better against Australia too — 79 wickets at 28.82 as opposed to 300 career wickets at 30.42! His career high Test score of 66 is just 3 higher than his highest score against Australia (the 63 that he made in that “Maan Ki” Test in Sydney). His best Test bowling figures (8 for 84) is against Australia too — in that epic Test match in Chennai in 2001. It is clear that Harbhajan Singh turns it on whenever he plays against Australia. More power to him. If India play on the momentum secured thus far and if the team continues to show the passion and the focus that was on display in the 2nd ODI at Nagpur, I think it will be hard for Australia to come back into the series. And for Australia to bounce back, skin will be important! Yes! Someone from the Australian team must play out-of-their-skin cricket and the team must not allow Harbhajan Singh to get under their collective skins! I am now convinced that, unlike his efforts with the bat, Ricky Ponting is inconsistent with his mouth! Here is a sample of what Ponting has said (or reported to have said) just in the last few months! This was precisely 45 days ago. So what’s changed in the intervening period for Ricky Ponting to discard his “momentum theory”? And at the start of the ongoing series against India, Ponting’s utterances may have led the uninitiated to believe that the Asutralian captain does believe in momentum! It seems to me that what he has said in the above examples is that he believed in “momentum”. He now does not. Oh well. One theory when you win. One when you lose, I guess? Despite the newly-laid Delhi track which saw 4 sub-100 scores in the Champions League, I expect India to field an unchanged side. Australia have to make changes to the side. Tim Paine is back in Australia. Graham Manou is in. This will mean that Shane Watson and Shaun Marsh open the batting. I am not convinced that Cameron White is an appropriate player at #4. But there is something common about Cameron White, Australia and bad choices! Remember the Tests against India in India last year? I have no idea why Cameron White was in that Test side. I am not sure what he is doing batting at #4 in this ODI side. Maybe he will prove me wrong though. Who knows? It is likely that Moises Henriques will get his ODI cap in the Delhi game. He is the sort of bowler that may perform well on the Delhi track. I will not be surprised if Australia wins the Delhi match. This Ricky Ponting led team is strong and will fight every inch of the way. And if Australia does win, expect Ponting to say that he was happy to have “reclaimed the momentum”! Now we yearn for “The Dhoni of Old”… Duh! Forget the present. Forget the future. It seems Indians want to continue to live in the past! Chairman of selectors, Kris Srikkanth, pronounced that we had seen “the old MS Dhoni” after India beat Australia by 99 runs in the 2nd ODI at Nagpur last night. In the recent past, we have had many a report suggesting that the “Tendulkar of Old” was there or thereabouts. Every time the great champion batsman scores a century, we hear talk of the “Tendulkar of Old”. As I keep saying to a lot of my friends, if you want to see the “Tendulkar of Old”, buy a DVD! If you want to see the “Dhoni of Old”, buy yourself a DVD! In the meanwhile, rejoice the present and plan for the future! Duh! Surely that can’t be too hard! India needs players who perform consistently in the role that they (a) are able to perform, (b) are best at performing, (c) have been given (or taken on for themselves). Meanwhile, I do hope the sales of the DVD of Dhoni’s 183 skyrocket for those of us who want to see the “Dhoni of old”. If we do not rejoice the “Dhoni of Now” or the “Tendulkar of Now”, a few years from now, we will yearn for the “Dhoni of the immediate past” and forget that we had just watched but not understood nor relished that phase of a cricketers’ evolving career! The match last night was a fascinating and clinical performance by India. The manner in which Dhoni and Gautam Gambhir re-built the innings and stabilised it suggested that both batsmen had a plan and knew exactly what was needed and how to get there. They were calm, unflustered, purposeful and measured in their approach. Perhaps Gambhir got out at the wrong time — just before the ball would be changed and probably just before the Batting Powerplay would have been taken (had Gambhir been there). However, his departure meant that Suresh Raina and Dhoni, together, turned on an intelligent and power-packed partnerships in which audacious shots were mixed with sharp running and clever placements. And once the foot reached the pedal, in a very Australian manner, the two of them kept their foot on the pedal to take India to an unassailable total. The bowling was impressive too. I was particularly impressed with Praveen Kumar’s line-and-length discipline. And it was certainly refreshing to see Ishant Sharma reach the 140-145 kmph mark regularly. He seems to have worked out his problems. He was running in more confidently and with greater purpose. I will be surprised if India change the team for the next ODI in Delhi (Sunday). Meanwhile, Australia have a few more problems. Wicketkeeper Tim Paine is flying back to Australia with a broken finger! Meanwhile, the “Adjective Watch” department of i3j3 has woken up from its long slumber! After all, Australia is playing India! And what were the Australians doing when said verbal blows were being traded? Oh! They were knitting, as every good, honest, God-fearing, mother-loving, saintly and pristine Australian cricketer would do. Of course! What did the fiesty, wily wind-up merchant and infamous obnoxious weed of an off-spinner actually say? I read humility. I read dignity. I read respect for the opposition. I also read an element of self-doubt. Then again, who am I? I am not an Australian reporter with hatred in my eyes, a chip on my shoulder and an axe to grind. Much has been written about India not going that extra mile to win the last Test in New Zealand in the last few days. I wrote about India missing a “Tipping Point” moment. Mahesh also wrote about Good Enough not being Enough anymore! These thoughts were summed up pretty accurately by Samir Chopra, in his CricInfo Blog. Some of us Team India fans could not digest the go-slow approach at The Oval against England and still got over that disappointment to savour India doing well subsequent to that in the T20 Championship and against Australia. Some of us could not digest the last Test draw against England in December, but still got over that to savour India’s success against Sri Lanka and New Zealand. Similarly, I am sure we will get over the disappointment of a mere 1-0 win against New Zealand! Setting the expectation bar higher is not necessarily a bad thing! However, I am confident that the disappointment of a mere 1-0 result in New Zealand will soon be forgotten as we see the dancing ladies, pom-poms and skin-tight lycras of cheer-squads in a variety of T20 and ODI tournaments that India has lined up over the next few months. As we look back on Team India’s tour of New Zealand, we look forward to a year filled with T20 and ODI tournaments. India does not play a Test match for a while now! So who were the heroes and the zeroes of the NZ tour? India’s support cast of M. Vijay, Amit Mishra, L. Balaji and Dhawal Kulkarni did not get a gig. That speaks as much to India’s consistency as well as it does to the faith that the team management reposes in its players. In my view, this is how the rest of the tour party fared in the Tests. 9.5: Gautam Gambhir — The biggest hero to emerge from the tour. He was the biggest find of the tour. He convinced everyone he could bat outside India. He saved the Test match in Napier for India and scored heavily in every Test. Although he had a marginal ODI tournament, he played well enough to emerge as an A-lister! In my view, it is because of him that India has risen to #3 position in the Test rankings. When asked some time back whether he preferred Aakash Chopra or Gautam Gambhir as his opening partner, Sehwag said, “I prefer Chopra because he gives me more of the strike!”, and therein lies the value of Gautam Gambhir. He is a diminutive opener, built in the Justin Langer mould. He has the fighting qualities that Langer brought to his game. But he mixes those fighting qualities with the aggressive mindset of a Matthew Hayden. In my mind, there was a question mark over his stomach for a back-to-the-wall fight. There was also a doubt over how he would perform in seaming conditions. Gambhir has ticked both boxes emphatically and emerged from the tour as India’s biggest asset despite a somewhat lacklustre showing in the ODIs. His poor ODI showing makes his Test performance even better! He shrugged off indifferent form in the ODIs to score heavily in the Tests. Full marks to this impressive lad. 9.0: Harbhajan Singh — He won the Test match for India in Hamilton by taking 6 wickets in the second innings. He bowled well as India’s lead spinner. He also topped the bowling charts in terms of # of wickets. India needs Harbhajan Singh to step up to the plate. Right from his debut series, it is when he has been labelled the “lead spinner” that Harbhajan Singh has emerged strongest. So also on this tour. He emerged as the highest wicket taker in the series. But more than that, he bowled with zip, rip and flight and rarely speared balls in as his wont! Apart from his performance in the Tests, more often than not, it was Harbhajan Singh that turned the screws on in the ODIs too. Apart from his bowling, Harbhajan Singh continues to develop as a bat. A solid #8 is vital to India’s hopes of ascending the Test ladder and Harbhajan Singh has constantly been part of major rearguard fights — Sydney 2008 and Bangalore 2008 spring to mind immediately. 8.5: Zaheer Khan — He had a wonderful tour. He bowled more overs than either Ishant Sharma or Munaf Patel. He shouldered the ace pace bowler responsibility and performed solidly. He made initial breakthroughs almost always and shone with the bat too. A recent analysis of his overseas performances underscored Zaheer importance to this team. He has taken 149 of his 210 wickets away from ‘home’. “His percentage of 70.95 is the highest among all bowlers who’ve taken at least 200 wickets. In fact he is well clear of second-placed Michael Holding, who has a percentage of 65.46.” Impressive indeed. Zaheer Khan had a very good ODI series too. Like Harbhajan Singh, Zaheer Khan too has impressed with the bat lately. It is always comical when Zaheer Khan and Harbhajan Singh bat together — not quite in the Javagal-Kumble mould, but comical nevertheless! Both of them seem to relish making contributions to the team cause with both bat and ball and so get close to full marks. 8.0: Sachin Tendulkar — He also had a wonderful tour. It seems that Tendulkar has found second wind in his career after beating Brian Lara’s record. He seems almost unstoppable these days. I will not say that his fluency reminded us of the “Tendulkar of the old”. I am convinced that the Tendulkar of today is the Tendulkar we see today! The Tendulkar of old is exactly that — Tendulkar of old! His 160 in Hamilton was a gem, but for me, his 62 in Wellington was the score I’ll store on my favourites. It is a pity that India is not playing too any more Test matches in the next 8-9 months. His 160* score in the ODI series has many people still drooling. He would have gone on to make a 200 (perhaps) but for a stomach muscle tear. 7.5: V. V. S. Laxman — Laxman proved his detractors wrog — again! The man has always been fighting off his detractors. But it looks like he is finally comfortable in both his own shoes as well as the role he has in the team. With Sourav Ganguly’s departure, he has moved one slot higher in the batting order. He also seems to draw comfort from the knowledge that he has the dependable and rock-solid Dhoni coming in after him! This has enabled him to play his own game lately. And whether it is defence or attack, he has looked assured, while looking attractive. His second innings century at Napier was fluent, artistic and solid — all at once!He scored 295 runs at 73.75 in the series! A good series which is only blotted by the knowledge that we will have to wait a while to see him in India colours again! 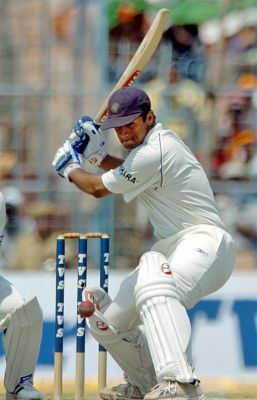 7.0: Rahul Dravid — Although he had hit a century in the previous series, a sword continued to hang over this mans’ head! With the recent retirement of Sourav Ganguly, the clarion calls were growing for Dravid’s imminent departure or announcement. Dravid did make an announcement! It was that he was not in a tearing hurry to leave the scene! The chapter is still incomplete! He will be disappointed that he did not convert his starts of 66, 8*, 83, 62, 35 and 60 to much more. However, he will take the 314 runs he made @ 62.8 any day although he will rue the poor umpiring decisions he received! But these were strong returns for this Gentleman of Indian Cricket. He also signalled that he will be around for a while longer. And judging by the way he played, who would begrudge him his opportunities? It would do him and Team India good, however, if the selectors sat him down and worked out his plans for the future. Again, his good series is only blotted by the knowledge that we will have to wait a while to see him in India colours again! 6.0: Virender Sehwag — Virender Sehwag puts fear into the opposition when he walks in. He showed how dangerous he could be in the ODIs. His amazing ODI century was breathtaking in its audacity as well as its brutality and skill. And that is purely why Sehwag is higher in the rankings than Dhoni. In the Tests, Sehwag missed out after making some explosive starts. He had a terrific start at Hamilton and missed out. He received a lot of flack for the shots he played against Daniel Vettori and Jeetan Patel in Napier. But we have to perhaps learn to accept that that is how he plays his game. He lives for today and it perhaps does not hurt to have a player like him in the midst, especially since India has, in Gautam Gambhir, one of the more dependable openers in recent memory. 5.0: M. S. Dhoni — He had a funny tour, in my opinion. He still hasn’t lost a Test match as captain. He brings that X-factor to his captaincy and his team. He is positive and fearless and his energy seems to rub off on his team — even the “seniors” in it. His absence was noticeable in the Napier Test. Virender Sehwag, the next best leader-option in the team — assuming that Dravid, Tendulkar and Laxman will not take up that responsibility — was shown up quite badly. Sehwag seems to lack a strategic bone in his body and, to his credit, does not seem to really want one or need one! But Dhoni was missed in Napier. His wicketkeeping was missed in Napier. His batting was also missed at #7 and I personally missed his almost non-stop Hindi commentary from behind the stumps! I seriously think that the TV station should run a separate “Dhoni Channel” when the cricket is on! But that’s another matter for another day… He keeps it simple and uncomplicated. When asked about why the team arrived “late” into Napier (only the afternoon before the Test match), he said, “The mind doesn’t know if it’s Napier or not. You come and say this is Napier it believes it’s Napier, you say it is day it believes it is day because it’s about how you treat the mind… We think more about the small steps rather than have a look at what we want to achieve in the longer run. We know that if we achieve the small milestones what we want to achieve in the longer run will take care of itself. We think about a series, and we break the series into games. And every game is a different game in which we start from scratch.” By the way, this is exactly what Greg Chappell was saying too! But he made himself out to be a pontificating Guru. He was constantly challenged, continually ridiculed and then shown the door! Dhoni brings that earthy matter-of-fact approach to leadership. But despite his X-factor captaincy and despite his solid showing in both ODIs and Tests, he scores low in my books because of his wrong decision on the 4th morning of the 3rd Test — my view on this was recorded at the end of day-4 of the Test match itself (well before rains turned the 2-0 party in Wellington into a mere 1-0 party!). 4.0: Ishant Sharma — Ishant Sharma promised more than he delivered. He is still a work-in-progress. He will improve. He will get better and stronger. India needs to invest more on him. He had a good match at Hamilton but struggled to bowl into the wind at Wellington. Of course, all bowlers struggled at Napier! He bowled well in patches and it is fair to say that he will have learned from this outing. 3.0: Munaf Patel — I really do not know when players like Munaf Patel will realise that it is not enough to just rock up on the park and assume that “she’ll be right, mate”! The fact that the entire team applauded a dive that Munaf Patel put in on the boundary rope is symptomatic of his problems. A dive must be de rigueur. If your team mates are surprised that you can actually dive, that is cause for concern! He blows hot one day and cold the next. He lacks consistency and I suspect that it is because he either does not “put in” enough to his game and his preparations. Or maybe he just leaves his thinking cap behind in the Hotel room every morning! He had a terrific match in Hamilton. He played the 3rd bowler card perfectly and performed his role to perfection. He kept it tight and took wickets too. However, when the batsmen got stuck into him at Napier, he dropped his bundle and his tour went South from there on! He looked completely disconnected from proceedings subsequent to that point. He dropped catches, could not bend down to field regular shots and just missed the point of being part of a team! He needs a wake up call or a kick up his backside. He needs to work on his fitness, period. You are not going to teach him to be a better fielder and dive around the park. Not now. He has missed that bus many years ago! However, what he has to learn is complete commitment to his fellow bowlers — if not the entire team. A good, mentally strong, fit and committed Munaf Patel is important for India if she is to challenge the #2 and #1 spots. 2.0: Yuvraj Singh — What I wrote about Munaf Patel could be said about Yuvraj Singh too. He had several opportunities to not only cement the #6 spot, but make it his own. Instead, he used the tour to default on his loan repayments. His line of credit has been extended. But only just! He had a poor tour. For me, it was less his ability with the seaming ball and his low returns that made me give him such a low score. It was due to his overall lethargy in the field. He just did not seem to belong in this company. A few years ago, he was the touted as the great hope of the Indian infield. He was! He was seen as the messiah that would inspire a generation of Indian cricketers to throw themselves around on the park like a Jonty Rhodes or a Ricky Ponting. Today he is already a pale shadow of what he was even yesterday! Unfortunately, this means that he might need to start all over again! I think he can do it. He has to sharpen his fitness and lose those needless excess kilos. He also has to fix that ‘dodgy knee’. He seems to me to be a man pre-occupied by that weakness. We may then see a better, fitter and a more free Yuvraj Singh. 1.0: Dinesh Karthik — The only positive contribution from Dinesh Karthik on this tour is that he has ensured that Yuvraj Singh does not get lined up at the rear of the class! I would not be surprised if Dinesh Karthik played his last Test at Napier. The only good thing about his ‘keeping in the 1st Innings of that Test was that he made the Kiwis wonder if he had been selected for his batting! Once they saw him batting, they were left scratching their heads! I strongly believe that it is time the team and the selectors invested in Wriddhiman Saha, Naman Ojha and Srivats Goswami. Overall, this was a steady tour for Team India. I’d have preferred a 2-0 result, but will take this in the hope of better things in the future. In conclusion, I must say that the pitches as well as the schedule worked in India’s favour. Gautam Gambhir was “allowed to fail” in the ODIs without allowing it to form a ‘mental block’ for him. The bowlers — particularly Zaheer Khan and Harbhajan Singh — got used to the conditions. So a big tick to the BCCI for drawing up a schedule. A big tick too to the BCCI for also organising for Dravid, Laxman, Kulkarni and Laxman to play a few provincial games in New Zealand. It can’t have hurt India’s preparations. In a conversation on India’s most famous recent victories, an India cricket fan will invariably allude to Kolkata 2001, Leeds 2002, Adelaide 2003, Multan 2004, Sabina Park 2006, Johannesburg 2006, Perth 2008, and Mohali 2008. After yesterdays’ sensational, come-from-behind-victory at Chennai the India cricket fan would be compelled to add Chennai 2008 to this growing and impressive list of victories. India’s victory at Chennai ranks right up there with the victories in the above list. Some victories just fade into history quietly. Some linger for much longer and some — like the list presented above — stay in the memory for specific reasons. For example, regardless of the team they support, few cricket fans will ever forget Leeds 1981, a match that was turned on its head by one man who refused to let the Australians run over him. Similarly, each of the above India victories will have special significance because of an individual brilliance performance or a special team performance. Chennai 2008 may never acquire the status of a Leeds 1981 or a Kolkata 2001. But in the annals of Indian cricket history, it will rank right up there as one of India’s best ever. First though, mention must be made of England’s courage and commitment to the game. There will be a few cynics that say that the IPL careers of Kevin Pietersen and Andrew Flintoff — and perhaps a few other English players — rested on Englands’ decision to return to India to play a Test match after the 26/11 terrorist attacks in Mumbai. But I am not sure Kevin Pitersen, Andrew Flintoff, Paul Collingwood and their mates would be ready to risk their lives in the search of a few IPL dollars. I do applaud Englands’ decision to not bow down to the terrorists. it was a brave decision. It was a show of solidarity to the people of India and the people whose lives were affected by the cowardly actions of the terrorists. And if Englands’ decision thaws ECB-BCCI relations, gets England a few BCCI-Brownie points and also a few IPL contracts, I certainly will not begrudge them their place in the sun. Courage has to be rewarded. This was certainly a strong and compelling statement from Pietersen and his men off the field. On the field, England played good cricket for three and a half days. Just as Australia had blown their series against India at Nagpur in the 3rd session of the penultimate day, in this Test, England blew their chances through slow batting that defied belief. There are a few reasons make this a special win. India won after being behind in this Test from the moment she lost the toss. Many visiting teams talk about the toss being all important in India. The hosts showed that the effect of the toss can indeed be nullified if a team believes in itself and its abilities. The total that India chased was the 4th largest 2nd Innings total that any team has made to win a Test match — that India has won two of the top four largest second innings winning totals says something about the tenacity that is developing in this new team. But more importantly to me, this win was made on the back of backs-to-the-wall grit from players like M. S. Dhoni (1st innings) and Sachin Tendulkar and Yuvraj Singh (in the 2nd innings). Furthermore, unlike Mohali 2008, where almost everyone in the team contributed to the victory, this was a Test which was won mainly on the back of performances from a few — Dhoni in the 1st dig, Sehwag, Tendulkar and Yuvraj Singh in the 2nd Innings. Amongst the bowlers, only Zaheer Khan bowled with some fire although Ishant Sharma bowled well too. So, from that point of view this was indeed a strong victory. India march to Mohali for the 2nd Test with Dhoni having won 4 from 4 Test matches that he has captained; not a bad start for him as India captain! The only change I expect in Team India is Laxman coming in at #3 for Rahul Dravid, who must have felt the guillotine drop an inch or two after the Chennai Test match. Harbhajan Singh’s bowling was a disappointment in Chennai. The team will be looking for a spirited performance from the Indian off-spinner.